Ratings: How did Doncaster Rovers’ players fare in the draw with Peterborough United? John Marquis in action against Peterborough. 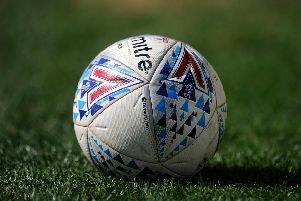 Sports writer Paul Goodwin gives his verdict on Doncaster Rovers’ 0-0 draw with Peterborough United. Had to work hard in the first half to keep his second clean sheet of the season. Much quieter second half. Another excellent display from the in-form youngster. Calm and composed, made several important interventions. Typical no-nonsense display in the middle of the back three. Communicated well with Garratt and Wright. Held his own defensively against free-scoring Posh but his distribution from the back let him down. Again provided an outlet at right wing back and made a couple of decent runs. Lacking conviction in his play at times though. Started the match very well as he imposed his passing game on Posh. Him and Houghton could develop a very solid midfield partnership. Slotted into a central midfield position and kept things ticking. Faded before being subbed for Houghton. Did a sound job for the team at left wing back but it is debatable whether that position gets the best out of him. A mix of good and not so good from the skipper - some nice touches but also caught in possession a few times. Rovers need to find a way of getting their attacking lynchpin more in the game. Presented with a good chance early on but his shot was fairly tame. You know what you’re getting from this lad - another hard-working display before making way for Williams. Came on for Coppinger and looked to link things up at the tip of the diamond. Neat and tidy but, like his teammates, unable to find that incisive pass. A welcome and confident return to action for the Chelsea youngster. Despite his injury nightmare he did not look to be hampered at all by any mental or physical issues. Looks determined to force his way back into the starting eleven and managed to give the Peterborough backline something to think about. Marko Marosi, Craig Alcock, Harry Toffolo, Issam Ben Khemis. Jonathan Bond 6, Ryan Tafazolli 7, Jack Baldwin 7, Steven Taylor 7, Gwion Edwards 7, Leonardo Da Silva Lopes 6 (Hughes 71, 6), Michael Doughty 6, Anthony Grant 6, Marcus Maddison 7, Junior Morais 6 (Kanu 61, 5), Jack Marriott 6. Subs not used: O’Malley, Shephard, Lloyd, Anderson, Forrester.